The Vancouver Condo Buzz » Southeast False Creek AVENUE ONE Vancouver Parkside Condos Now Selling! The Essence of Seaside Living in Vancouver! 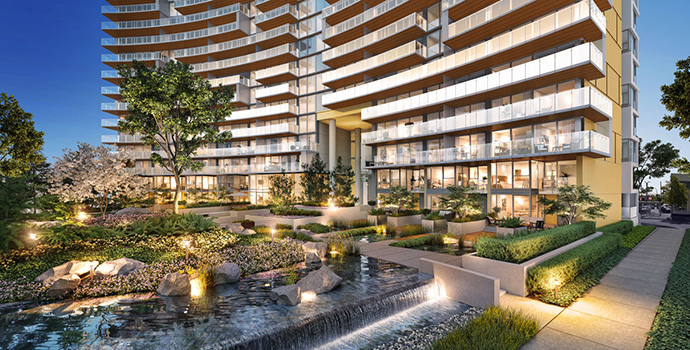 Situated in the False Creek waterfront, the Vancouver Avenue One Condos by Concord Pacific redefines living in the city’s most sought after neighbourhood. 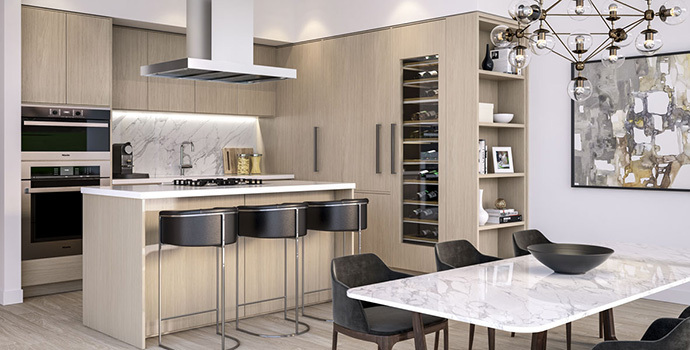 Situated in a rare park front property, the Avenue One Vancouver condos is in a class of its own. A lush urban oasis with water features, gardens and recirculating wetlands along the shoreline make up Hinge Park, a beautiful place to relax. But one of the most important and unique features at the presale Vancouver Avenue One False Creek condos is the new concept by Concord Pacific called “Outdoor Living Rooms”. The extra spacious 2 bedroom suites will come with these Outdoor Living Rooms that feature outdoor solar shades, alfresco sliding door, porcelain tiled floors, gas outlet, hose bib and wood look soffit ceilings with heaters and lighting. 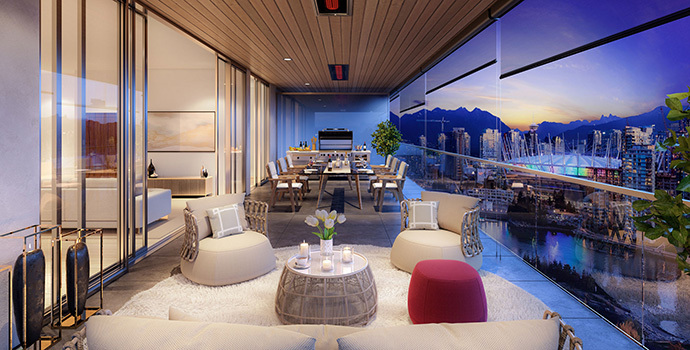 These spectacular outdoor living spaces at Avenue One Vancouver luxury condos allow residents to enjoy that much sought after indoor-outdoor living arrangement whilst overlooking the beautiful water and mountains. 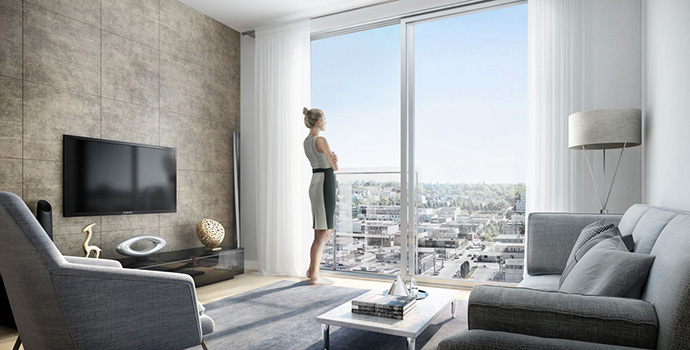 And for one bedroom suites at Avenue One False Creek, residents can enjoy Juliet balconies and balconettes with views. Other highlights of this new Concord False Creek building include an in-house Automatic Touchless Car was in the parking area as well as opulent finishes that not only look incredible, but also are very functional. Custom crafted details and millwork come standard in these five star residences. In addition, the Southeast False Creek Vancouver neighbourhood has become of the most prestigious and sought after communities with its vibrant selection of restaurants, cafes, services, shopping and close proximity to downtown Vancouver and the water. 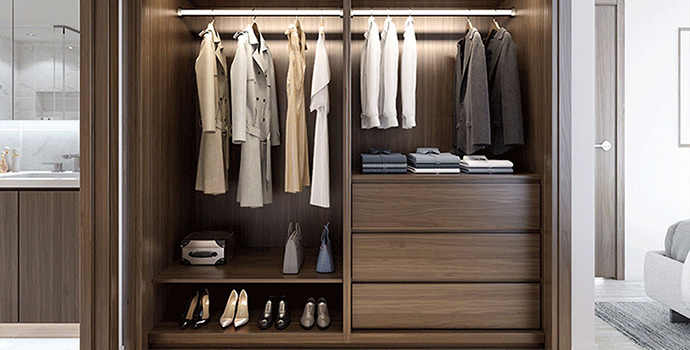 Other thoughtful details at Avenue One Vancouver luxury condos includes 100% electric vehicle parking bays, intelligent/smart thermostats as well as WiFi access in the lobby entrance and the amenity level. For more information about the Concord Avenue One condos, please visit www.avenueone.ca or register your interest online here. Avenue One Vancouver is centrally located in the Southeast False Creek neighbourhood, home to new shops, retail, restaurants and close to the new Emily Carr and future St. Paul’s Hospital site. Transit options are a plenty as well with the AquaBus that can take you to Yaletown or Granville Island as well as two SkyTrain lines that connect within walking distance from your new home. The Southeast False Creek neighbourhood is well known for its pedestrian friendly walkways and Seawall in addition to many bike routes and major car thoroughfares. 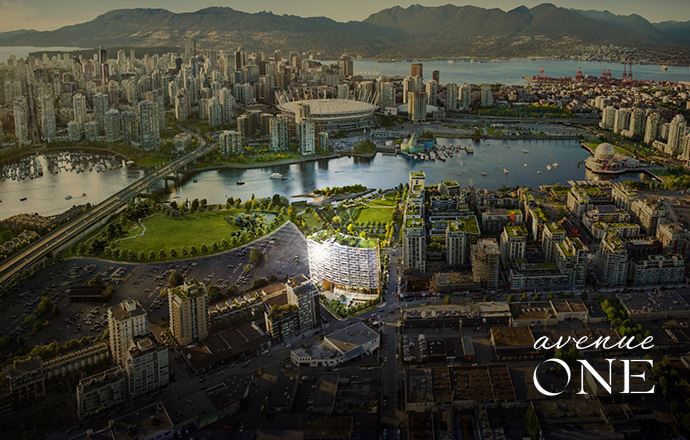 The park front site at Avenue One Vancouver condos is all about serenity and relaxing urban living. Hinge Park just outside your home will be a beautiful place to unwind with water features, meandering paths and beautifully lush landscaping. The Creekside Community Centre is also very close as is the village centre and many new restaurants, eateries and cafes that you can explore. Just west of Avenue One by Concord will be West Side Vancouver will you will find UBC, Vancouver General Hospital, Vancouver City Hall, and much more. 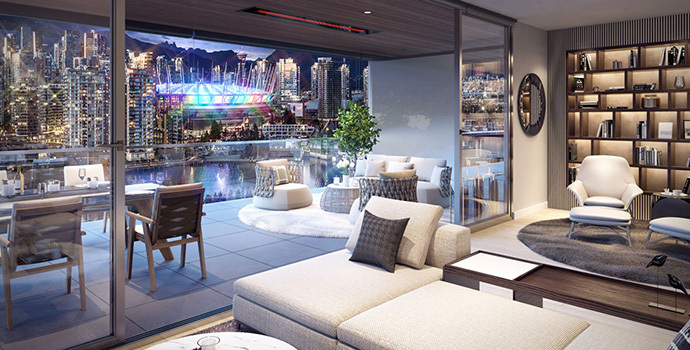 The views will also be stunning, with unparalleled and unobstructed views north towards BC Place Stadium, False Creek and the downtown skyline. You’ll also be able to see the beautiful North Shore mountains. 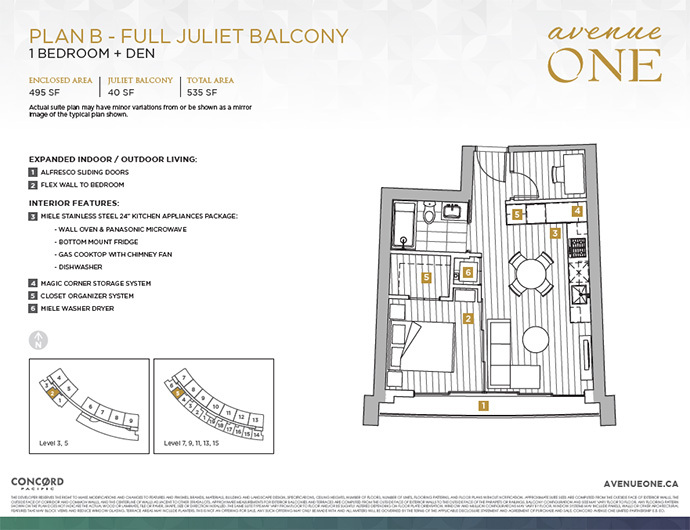 There are currently 2 featured floor plans that includes Plan B which is a 1 bedroom plus den and one bathroom layout with a full Juliet balcony. These homes are 495 square feet in size with 40 sqft outdoor living. 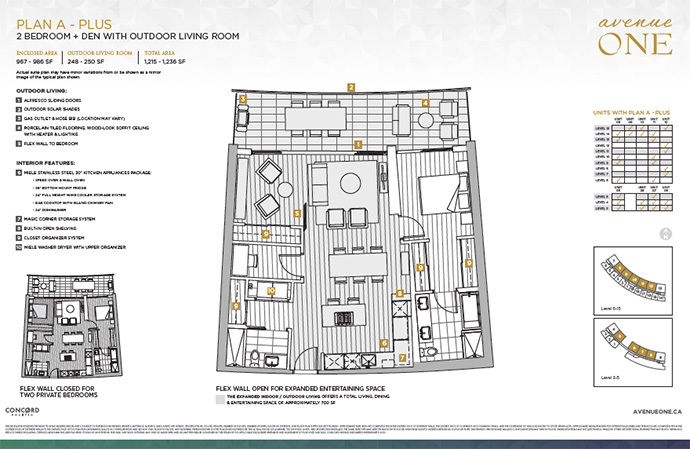 The spacious 2 bedroom Plan A is a 2 bedroom plus den unit with outdoor living room. The enclosed interior living space is 967 square feet and the outdoor living room is 248 square feet. There are more varieties of layouts at the sales centre. If you have any questions, please do not hesitate to contact us by filling out the online form at the top of this page. 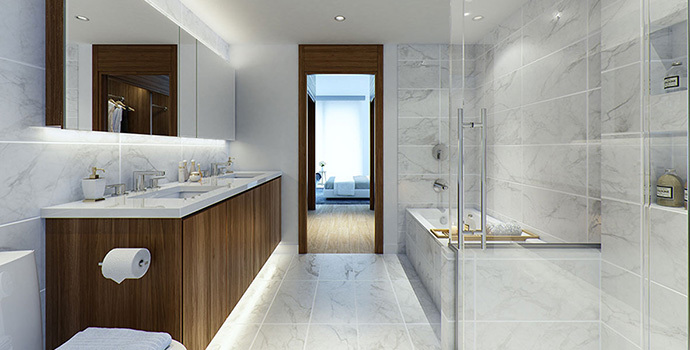 We will be able to find out the latest availability and pricing for the presale Vancouver Avenue One condos.